The Givens House Is A Three-Story Victorian In The Heart Of Downtown Stanford. It features four bedrooms, each themed after places the owners love, and four full baths. Other highlights include a spacious living room, dining room, kitchen, and small laundry area, as well as three porches for outside enjoyment. Gas fireplaces are in the downstairs living area and dining room, and a gas grill is on the back deck. The Givens House works is perfect for a large group or family, or even a couple who would like to entertain. The dining room, kitchen, living area and Texas Room are on the first floor. The Texas Room features a queen bed, a gas-log fireplace and a bathroom that’s accessible off the kitchen. Two bedrooms and two baths are on the second floor. The Shaker Room has two twin beds and a bathroom just down the hall. The Kentucky Suite has a king bed and large en-suite bathroom with a Jacuzzi tub, shower and a walk-in closet. The Africa Room comprises the third floor, with a queen bed, a twin foldout bed, and a window seat that can function as a bed for a youth. The room also has an en-suite bath with a shower. 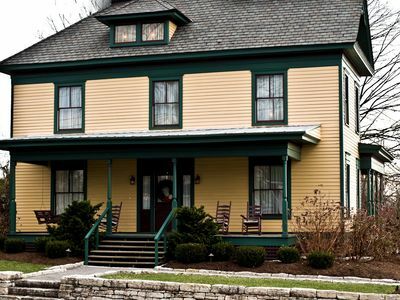 Amenities: Fully-furnished kitchen, Keurig coffee maker and coffee, Elmwood Inn tea, spring water, wireless internet, TV and DVD player with movies, books, games, washer and dryer, iron/ironing board, hair dryer, full-length bathrobes, luxury bedding and linens, and Plainview Farm bath products.